Scoring measurements: Score piece of card cut to 15cm x 22cm at 1cm and 14.5cm. Ink your embossing folder (female side, no raised edges) with an embossing ink pad. Be careful not to rub your stamp pad on your folder as it might cause wear and tear on your ink pad. Just pat and press your surface. 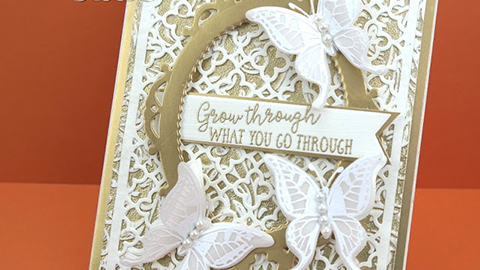 Run your embossing folder and card (6in x 6in) through your die cutting machine. Sprinkle gold embossing powder and shake off excess. Remove excess powder with a dry paint brush. Then heat with a heat tool to melt the powder. Once it cools, you can trim it and create your card!